This example deals with the same situation as in Example 89.1 in Chapter 89: The POWER Procedure. Hocking (1985, p. 109) describes a study of the effectiveness of electrolytes in reducing lactic acid buildup for long-distance runners. You are planning a similar study in which you will allocate five different fluids to runners on a 10-mile course and measure lactic acid buildup immediately after the race. The fluids consist of water and two commercial electrolyte drinks, EZDure and LactoZap, each prepared at two concentrations, low (EZD1 and LZ1) and high (EZD2 and LZ2). You conjecture that the standard deviation of lactic acid measurements given any particular fluid is about 3.75, and that the expected lactic acid values will correspond roughly to Table 48.9. You are least familiar with the LZ1 drink and hence decide to consider a range of reasonable values for that mean. You are interested in four different comparisons, shown in Table 48.10 with appropriate contrast coefficients. For each of these contrasts you want to determine the sample size required to achieve a power of 0.9 for detecting an effect with magnitude in accord with Table 48.9. You are not yet attempting to choose a single sample size for the study, but rather checking the range of sample sizes needed for individual contrasts. You plan to test each contrast at = 0.025. In the interests of reducing costs, you will provide twice as many runners with water as with any of the electrolytes; that is, you will use a sample size weighting scheme of 2:1:1:1:1. The variable LacticAcid1 represents the cell means scenario with the larger LZ1 mean (29), and LacticAcid2 represents the scenario with the smaller LZ1 mean (28). The variable CellWgt contains the sample size allocation weights. The CLASS statement identifies Fluid as a classification variable. 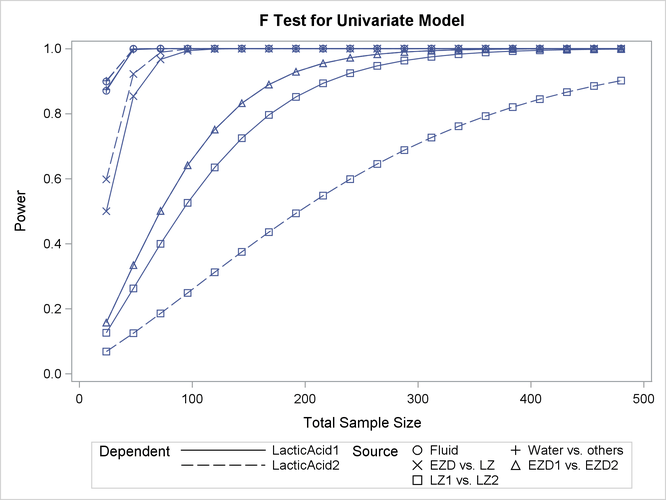 The MODEL statement specifies the model and the two cell means scenarios LacticAcid1 and LacticAcid2. The WEIGHT statement identifies CellWgt as the weight variable. The CONTRAST statement specifies the contrasts. Since PROC GLMPOWER by default processes class levels in order of formatted values, the contrast coefficients correspond to the following order: EZD1, EZD2, LZ1, LZ2, Water. ( Note: You could use the ORDER= DATA option in the PROC GLMPOWER statement to achieve the same ordering as in Table 48.10 instead.) The POWER statement specifies total sample size as the result parameter and provides values for the other analysis parameters (error standard deviation, alpha, and power). Output 48.1.1 displays the results. 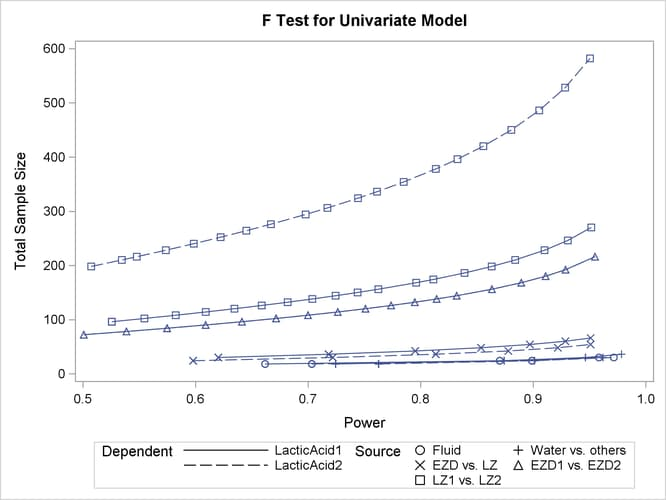 The sample sizes range from 24 for the comparison of water versus electrolytes to 480 for the comparison of LZ1 versus LZ2, both assuming the smaller LZ1 mean. The sample size for the latter comparison is relatively large because the small mean difference of 28 - 25.9 = 2.1 is hard to detect. PROC GLMPOWER also includes the effect test for Fluid. Note that, in this case, it is equivalent to TEST=OVERALL_F in the ONEWAYANOVA statement of PROC POWER, since there is only one effect in the model. The Nominal Power of 0.9 in the "Fixed Scenario Elements" table in Output 48.1.1 represents the input target power, and the Actual Power column in the "Computed N Total" table is the power at the sample size (N Total) adjusted to achieve the specified sample weighting. Note that all of the sample sizes are rounded up to multiples of 6 to preserve integer group sizes (since the group weights add up to 6). You can use the NFRACTIONAL option in the POWER statement to compute raw fractional sample sizes. In Output 48.1.2, the line style identifies the cell means scenario, and the plotting symbol identifies the test. The plotting symbol locations identify actual computed powers; the curves are linear interpolations of these points. The plot shows that the required sample size is highest for the test of LZ1 versus LZ2, which was previously found to require the most resources. Note that some of the plotted points in Output 48.1.2 are unevenly spaced. This is because the plotted points are the rounded sample size results at their corresponding actual power levels. The range specified with the MIN= and MAX= values in the PLOT statement corresponds to nominal power levels. In some cases, actual power is substantially higher than nominal power. To obtain plots with evenly spaced points (but with fractional sample sizes at the computed points), you can use the NFRACTIONAL option in the POWER statement preceding the PLOT statement. Finally, suppose you want to plot the power for the range of sample sizes you will likely consider for the study (the range of 24 to 480 that achieves 0.9 power for different comparisons). In the POWER statement, identify power as the result (POWER= . ), and specify any total sample size value (say, NTOTAL= 100). Specify the PLOT statement with X= N to request a plot with sample size on the X axis. Note that the value 100 specified with the NTOTAL= 100 option is not used. It is overridden in the plot by the MIN= and MAX= options in the PLOT statement, and the PLOTONLY option in the PROC GLMPOWER statement disables nongraphical results. But the NTOTAL= option (along with a value) is still needed in the POWER statement as a placeholder, to identify the desired parameterization for sample size. See Output 48.1.3 for the plot. Although Output 48.1.2 and Output 48.1.3 surface essentially the same computations for practical power ranges, they each provide a different quick visual assessment. Output 48.1.2 reveals the range of required sample sizes for powers of interest, and Output 48.1.3 reveals the range of achieved powers for sample sizes of interest.